Dell steps up to challenge Apple's MacBook Air again, this time with a large-screen ultra-thin laptop and promises of better performance than the discontinued Dell Adamo. Sources say that the initial 15.6-inch screen model will debut in the coming weeks for under $1,000--another big improvement on the ultra-premium price of the Adamo. Before the Dell Adamo bit the dust earlier this year, it drew a lot of interest as a Windows alternative to the MacBook Air, but the high-style laptop was widely criticized for being overpriced (a deluxe version started at $2,700) and under-performing. Dell may have learned a lesson or two from the Adamo experience, because the company is back for more and determined to roll out a whole line of ultra-performance, ultra-thin laptops, according to CNet sources. 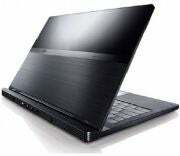 The debut model will be positioned as the first larger-screen ultra-thin laptop and will be targeted towards "prosumers". There's been a long and steady march of MacBook Air-rivals this year, from the business-oriented ThinkPad X1 to the curvy Samsung Series 9, but all of them, like the Adamo, copied the Air's 13.3-inch form factor. Besides boasting a larger, high-resolution display, Dell's upcoming laptop will use Intel's second-generation Core i5 and i7 processors. Dell is also still emphasizing "style and beauty" for this new premium laptop, which will be crafted from special materials. If a 15.6-inch display isn't the right size for you, know that the series will also include other screen sizes. Hopefully Dell can get it right this time, with both pricing and performance. For Windows users, the more MacBook Air alternatives to choose from, the better.